Judy Blume will be speaking at the University of Hartford on June 21st as a fundraiser for The Mark Twain House & Museum. I’ll be interviewing her onstage and taking tons of audience questions. In preparation, I will be reading her complete works and blogging about the experience. Get your tickets here. Just when you thought that Judy Blume was the master of young adult lit of the 70's-- that that was her niche, her jam, her corner of the world-- she goes and decides to write a picture book, just for the fun of it, and prove that she can look at a child's life from any perspective she chooses. 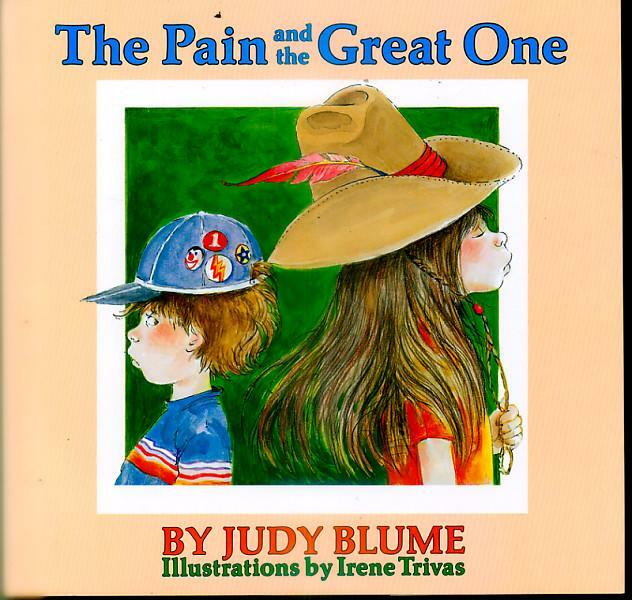 Actually, the text of The Pain and the Great One was originally published as a poem in the book version of Free to Be You and Me (side note: if you don't know what this is, please do yourself a favor and watch parts of the TV special on youtube. It is a glorious piece of 70's love and understanding), and like the rest of that project, gives a big hug to the idea that we're all different and have different perspectives on the world. I don’t understand how Mom can say the Pain is lovable. She’s always kissing him, hugging him, and doing disgusting things like that. And Daddy says the Pain is just what they always wanted. YUCK! I think they love him better than me. She thinks she’s great just because she can play the piano and you can tell the songs are real ones. But I like my songs better even if nobody ever heard them before. My sister thinks she’s so great just because she can work the can opener, which means she gets to feed the cat. Which means the cat likes her better than me just because she feeds her. This is a short book, but a lovely one. Sometimes all it takes to remind us that our point of view on the world is a relativistic one is a children's book. Our lives seem wonderful to others. Let's all try to keep that in mind. The pain and the great one will be back at the end of this read-a-thon, so stay tuned! I've come to like them very much. Fluzzy, too.